CT: Kyle, talk to me about your business? How did you start in the industry? KR: I left school with a reasonably high level of education, and while I was drawn towards hairdressing as a career choice, my parents encouraged me to go down a more “academic” career path and I began studying law. Shortly into my studies, I decided to give into my desires of becoming a hairdresser and made the move to become an apprentice hairdresser at a top hair salon in Aberdeen, under the tutelage of two British Hairdressing Hall of Famers. I then worked as a unisex hair stylist for 8 years before moving to focus solely on men’s hair and setting up Huntsman. CT:How has the rise of men’s grooming helped you and your business? KR: I suppose it goes hand in hand with what we do at Huntsman. 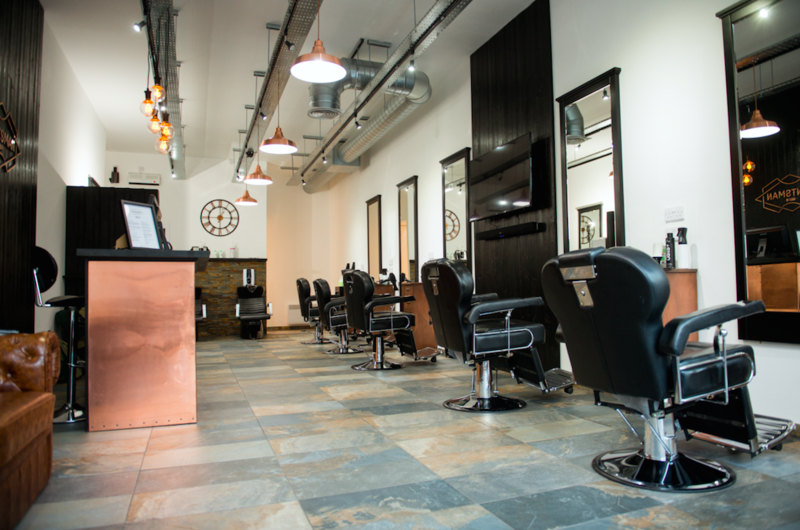 As a men’s grooming salon, the rise and continued growth of the men’s grooming industry benefits us greatly. Men now want to be looked after, and have time spent on them. They are willing to pay a lot more than in years gone by for the time spent on them. I actually spend longer cutting men’s hair than I would have done when cutting and blow drying a women’s hair, and the prices are coming more in line with each other. CT: Do you think Fashion has been a large part of the change? KR: It’s played a huge part. Men are much more image conscious than they used to be. I was lucky enough recently to be invited to London Fashion Week Men’s with Label M and Toni & Guy, during the Fashion Council’s opening speech they explained how in the next 3 years they expect the spending on men’s fashion to exceed that of women’s. You need to look presentable as whole, so if you’re dressing fashionably, an on-trend haircut to compliment your dress sense is a must. CT: You’ve beaten some of the best names in the industry at recent award ceremonies – how does that feel? KR: Industry recognition is always nice. It’s a great feeling when you know what your doing is being recognised, so I would be lying if I said it’s not enjoyable. The main drive for me however is the business and growing the brand. If my personal awards help to raise the profile of the brand then that is great. But a lot of the competitions, and more latterly work away from the business with session styling and educating are very time consuming. So I need to prioritise what events and competitions I attend, and get the right balance between being away from the salon and being there to look after clients as they are the most important. CT: What makes your concept different from the rest? KR: At Huntsman we cater to everyone. When designing the salon interior, I didn’t want to follow the “vintage barber” trend that everyone else was doing. I wanted it to look unique and classy, while still being a welcoming and relaxed environment that anyone would feel comfortable being in. Coming from a hairdressing background, I see myself as more of a men’s hair stylist than a barber. 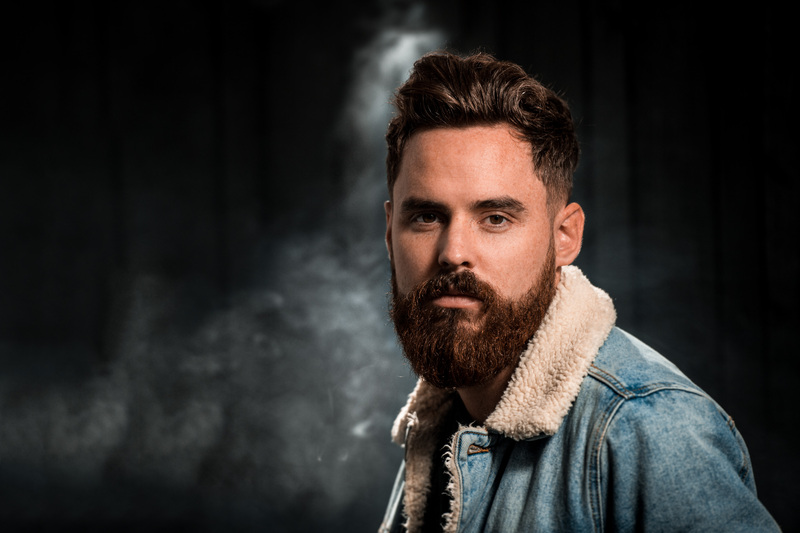 While we offer all of the reborn vintage barbering services such as hot towel shaving, we also offer all the services a man would expect to find in a unisex salon including hair colouring, eyebrow waxing, perming and chemical straightening. We serve beer and have Sky Sports on the tv, so this keeps the surroundings masculine and helps men to feel comfortable when receiving treatments and services that years ago would have been viewed as feminine. CT: Do you think there is specific needs for the contemporary male? KR: Very much so, but the specific needs vary from one client to the next. For me it’s about finding a style that suits someone’s lifestyle. If you have to rush out the door in the morning, or are very active and don’t have a lot of time to keep restyling your hair, then finding a style that looks good but requires minimal effort to style is the best option for you. At the same time, a lot of men come to us because they want to improve their appearance but don’t know where to start. They may not have felt comfortable before in a unisex salon surrounded by women. The amount of men who before coming to me, didn’t even own a hairdryer, still surprises me at times. We don’t only provide a tailored haircut to men, we teach them how to maintain their style at home, using a hairdryer and a round brush and guiding them towards which styling products to use and how to get the best results from them. CT: What products do you use and why? KR: We use label.m. Predominantly the label.men range with some other great products from the Label.m range that I feel work great on men’s hair. Again, coming from a hairdressing background, from day one of my career I was educated on the importance of great styling products. 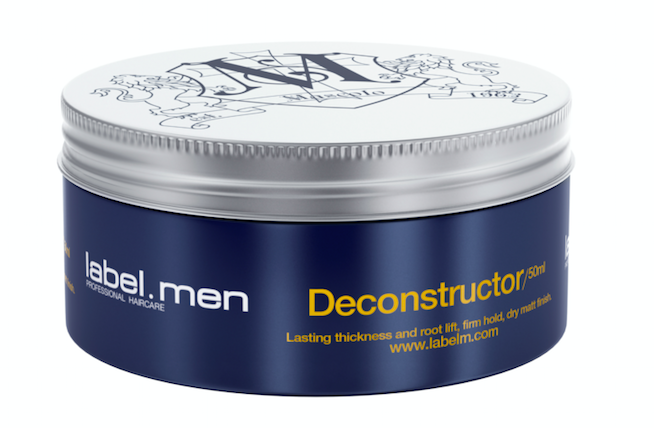 I’ve found a lot of men’s product ranges only provide finishing products (such as waxes and pomades) which are important. However, pre-styling products such as salt sprays, grooming creams and volumising sprays are equally important. I view and teach hair styling as a build up of layers. So if you want body in your hair, a volumising spray would become the foundation of this and give a bit more grit to the hair, a wax or a clay can then be used to provide some hold or show off some texture, and a hair spray can be added at the end to ensure your style stays in place. Having a range that covers all of these “ layers” is very important to what we do and label.m do just that. CT: Huntsman is also a label.m concept salon, how did you discover the range? KR: I was always aware of the label.m but was under the impression their products were exclusive to TONI&GUY salons. It wasn’t until one of their reps came in one day that I found out it was available to any salon to stock and I jumped at the opportunity to bring it in. CT: What one label.m product should every guy have and why? KR: While I could name many personal favourites of mine from the range, I’ll go with the one we sell the most of, which is Deconstructer (below). While the name would suggest it’s for messy or “undone” styles, it’s actually a very versatile product. Because it has a relatively matte finish and a good hold, it can be used in a number of different styles and I’m yet to find someone who has tried it and not bought it again when they have finished it. CT: Top tips for anyone getting into hairdressing / male grooming? KR: Learn as much as you can about hair and the science behind it. There are a number of barbers who are doing a training course and coming out of it with only a small knowledge of hair. They are then coming unstuck when they have to face something away from the “skin fade”. Fashions change and we are already seeing a number of guys moving to longer hair styles. Learn about face shapes and recommending styles that suit your client, learn how to dry and style hair and then go a step further. Learn why! Why was my favourite word when I was going through my training. I didn’t just want to know how to blow dry volume into hair, or why to cut hair at a certain angle, I wanted to know why I was doing it and what was actually happening to the hair to cause it to behave the way I wanted it to. The more knowledge you have, the easier it is to adapt to changes in trend, styles and fashions. CT: What’s your greatest achievements since starting? KR: It’s got to be Huntsman. The business was only a year old in November, but with what has been achieved in that time I have to give myself some credit for. I opened with myself and just one employee in Aberdeen, during the peak of an oil and gas recession in the city, and now have a team of ten. The awards have been nice, but seeing the business flourish in a city where everything else seemed to be closing down has been a rare success story for the North East of Scotland. CT: Name one celebrity you’d like to have in your chair and why? KR: It might be a bit predictable and cliché but I’m going to go with David Beckham. In my opinion he’s one of the reasons behind the boom the of the men’s grooming industry. A sportsman, idolised by many, who made it ok for guys to take care of their appearance, try different styles and I’d like to give it a go at finding one he hasn’t tried yet. KR: I’ve always been one to react to circumstance as opposed to having a definitive plan. So exactly what the future holds is as much your guess as mine. I’ve been asked to do some stage presentations over the next few months so that provides an opportunity to continue raising the profile of the brand. I plan to just keep doing what I’ve been doing for the past year and see what opportunities present themselves. This entry was posted in Beauty & Grooming, Interviews and tagged Huntsman Aberdeen, Interview, Kyle Ross, Label.m. Bookmark the permalink.